This entry was posted on December 7, 2012 by Tintean Editorial Team/fdg, in Interview, News. Bookmark the permalink. Francis (Francie) Collins, chairman of the Capital Development Committee of the Celtic Club, knows there’s many a slip ’twixt cup and lip, but is quietly confident that the proposed redevelopment of the Celtic Club will soon come to fruition. After 5 years of feasibility studies with commercial advisors and negotiations with the Department of Planning and Community Development, a Planning Permit for the development was signed off by the Minister for Planning, Matthew Guy, on the 29th October 2012. The architects’ (Peddle Thorpe) vision of the revamped Celtic Club …..
As all members are aware, the old club building, which dates back to 1876, is in a state of advanced and genteel decay and the options for many years has been to either spend major money on a cosmetic facelift (of which she has had many, most recently in the Tara and Cuchulainn Bars) or to sell the airspace above the Club and redevelop. The members took the fateful decision to explore the viability of the latter at the Club’s 2007 AGM. Francie, a civil and structural engineer originally from Tipperary, together with the Committee, had been working closely with Leighton Properties up to April this year to complete the Viability Phase of the project under the terms of a signed Exclusivity & Implementation Agreement (EIA). The purpose of the Viability Phase was to establish whether it was viable for Leighton’s to develop the site and build the Club new premises. 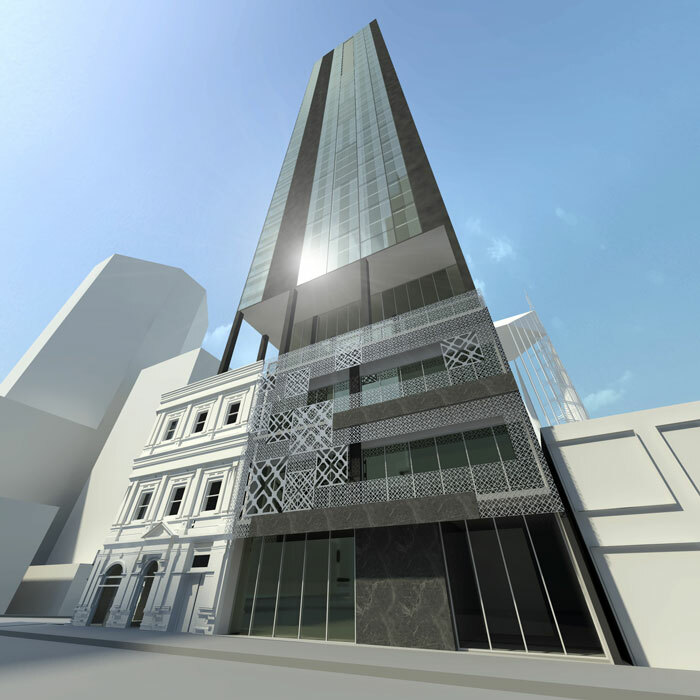 Over that time Leighton’s engaged a quantity surveyor to estimate development costs and sought advice from reputable real estate market research houses to calculate revenue assumptions and, together with the Committee and our commercial advisors KPMG, worked on refining the various elements of their financial model and the Club’s brief. However, at the end of the day, they were unable to make the project viable. 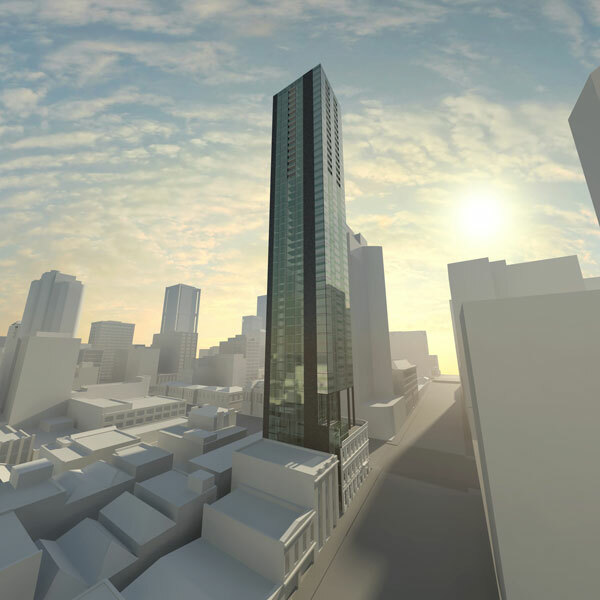 The quid pro quo which makes the development potentially viable is for the Club to get four floors and a basement for Club activities and for the developer to sell residential units on the remaining 44 floors above the Club. 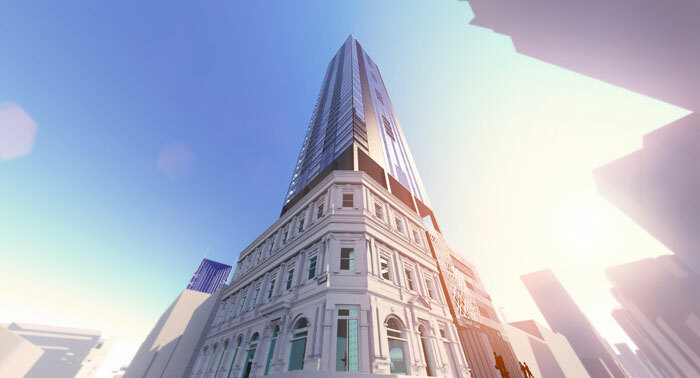 It is hoped that some members would choose to live in the residential tower and make better use of the new Club facilities. In the scheme submitted as part of the Development Application to the Minister, the basement would be for a mix of gaming (revenue from which underpins the Club financially) and for service areas for the restaurant and bars. The ground floor is earmarked for a bar and bistro, and is intended to be a welcoming space for members and passing foot traffic. The first floor currently features a more formal restaurant, but this may be subject to change depending on market demands. 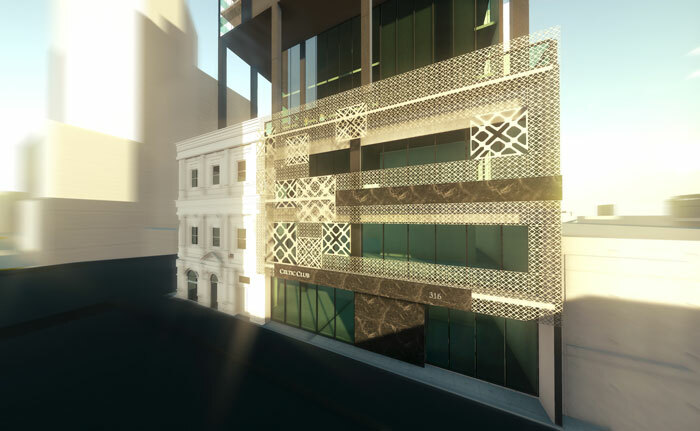 The second floor is intended as a Conference Centre with a flexible performance space, as there is a scarcity of small-medium-sized theatres (up to 150 seats) in Melbourne. 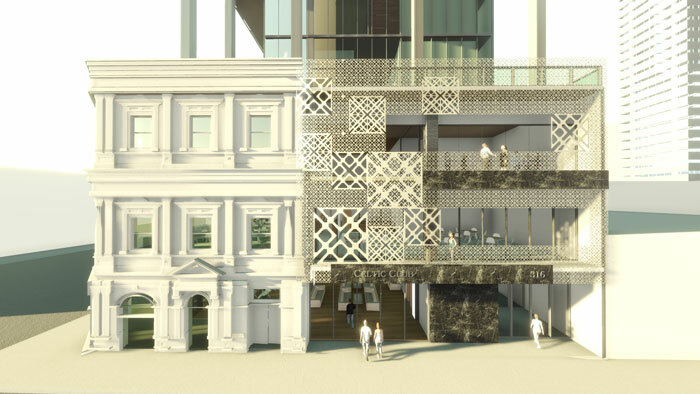 The third level will incorporate a ‘Cultural’ space for the Club’s own activities and also for many heritage and special interest groups, such as language groups, the magazine, and history circle. 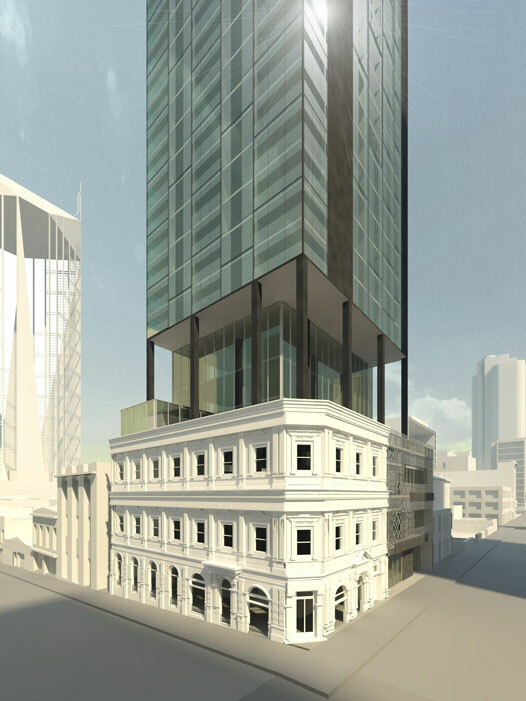 Town planners require minimum set-backs for the residential tower (to show off the retained historical façade and to reduce shadowing and wind tunnel effects), and the Podium level (see colonnaded space) is excitingly reserved for a Members Lounge, something that has been sadly lacking in the current Club. Further studies into the preferred uses of the proposed Club spaces will need to occur with input from members, and a developer brought on board. The challenge is that the footprint of the site is quite small at 620 sq. metres and hence may only be attractive to ‘boutique’ developers. The members have so far been supportive of the project, so Francie believes a 75% voting member approval rating is achievable to proceed with the re-development. Could the new structure be in place for 2016, the centenary of another renowned ‘Rising’, Francie wonders? Frances Devlin-Glass interviewed Francie Collins at the Immigration Museum on 18 November 2012.